Tell Prosecutor O'Brien: Tyre King Deserves an Independent Investigation! A 13-year-old child was killed by Ohio police --again. Almost two years after the killing of 12-year-old, Tamir Rice, Tyre King has become another victim of police violence against Black children. The police claim that Tyre brandished a BB gun, but Tyre’s family is not buying the police’s story. They initiated an independent medical examination and found that based on the location and direction of the wound paths, Tyre was running away from officers. Even eye witness Demetrius Braxton, who allegedly was with Tyre at the time of the shooting, said Tyre was running away from the police when they shot him dead. We cannot allow another Ohio officer to get away with killing a Black child. The Ohio community continues to call for Prosecutor Ron O'Brien to hold police accountable. Residents took to the streets to protest for O'Brien to take action after the police shooting of Tamir Rice in 2014, Henry Green in June of this year, and now Tyre King. But O'Brien repeatedly fails to act. O’Brien needs to step aside to ensure an accurate, independent investigation takes place. Will you stand with us and Tyre King’s family to demand O'Briend call for an independent investigation of Tyre's fatal shooting? Another child has died from police violence and your actions are long overdue. 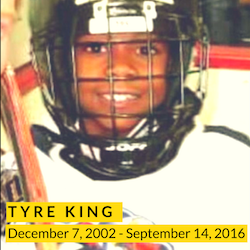 Tyre King, only 13-years-old, was shot and killed by police. Although the police claim he brandished a gun, an independent medical examination found Tyre was running away at the time of the fatal shooting. It is up to you to enforce transparency and police accountability. I stand with Tyre King's family and the Columbus community and demand that you call for an independent investigation of Tyre's death.